Our first volleyball training tool is the Tandem Sports Volleyball Pal. 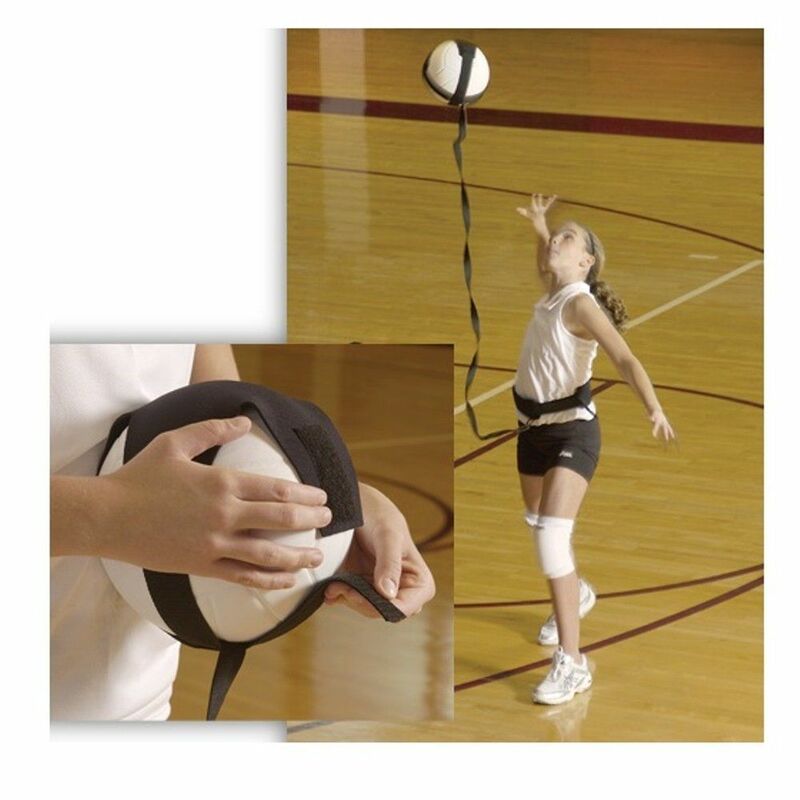 As you can see in the picture, this consists of a Velcro strap that goes around the waist and connects via elastic cord to a neoprene pouch holding the ball. 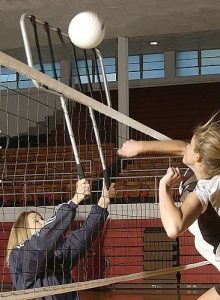 This allows the player to practice their serves or arm swings without having to chase down the volleyball. 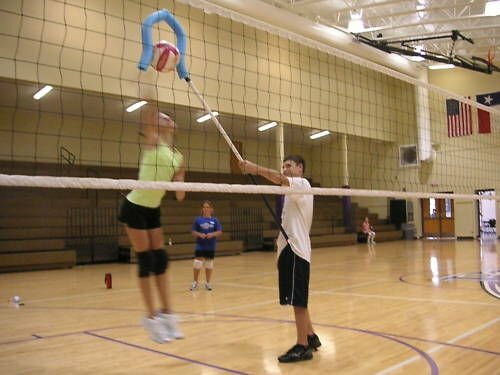 The elastic cord pulls the volleyball back after being hit allowing for faster and more focused practice sessions without needing another person. Our one concern is that if you are too tall the elastic might be too short for a proper overhand serve or it might pull the volleyball back very quickly. 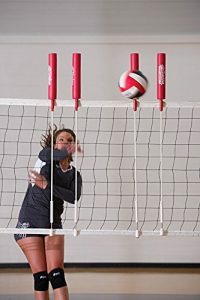 The Tandem Volleyball Pass Rite is an excellent training tool that can be used for solo or group practice at any skill level. It is a functional and simple way to reinforce the correct motions, form and muscle memory for proper passing. It is essentially a durable elastic band that connects to the wrist and ankles to restrain excessive upward arm movement. This helps to keep everything steady and forces the player to use their legs. The elastic band is also adjustable to match a player’s height and the Velcro cuffs are lightweight and minimal to avoid interfering with movement. Highly recommended, especially for novices. The Tandem Sport Set Rite is another training aid to improve the form and accuracy of volleyball setters. 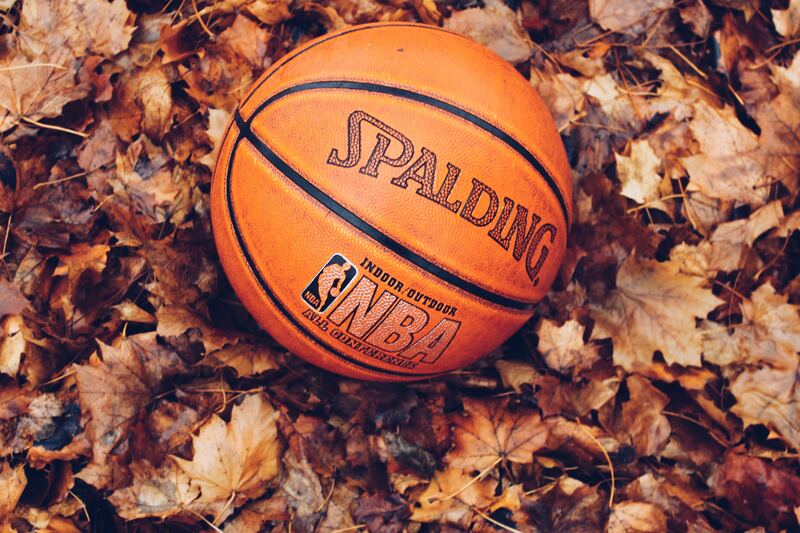 It teaches proper setting technique by reinforcing proper hand placement on the ball and eliminating too much hand contact. 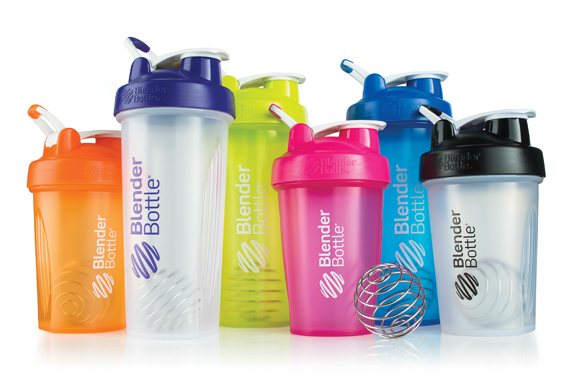 Each hand strap includes a plastic knob that sits on the palm to help keep proper setting form. 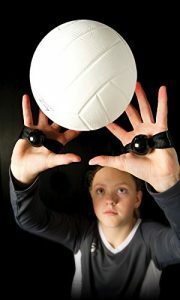 This volleyball training aid is best for beginner setters and very useful for combining with practice drills. For newer, younger players who might have sensitive skin from volleyball, try out the Tandem Sport Passing Sleeves. 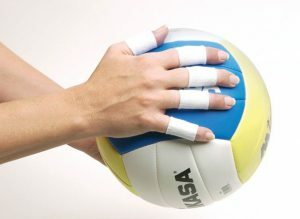 These help protect against repeated contact with the volleyball and floor and will reduce the stinging sensation and burn. It also helps younger players keep their eye on the ball so they can line up the correct placement of the volleyball hitting their arms. Works great for any beginners who are scared of hurting their arms and helps them ease into the game. 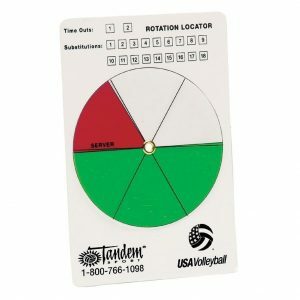 Great for coaches and for anyone learning volleyball rotation and positions, the Tandem Sport Volleyball Rotation Locator helps to keep track of rotations, substitutions, positions, and time outs. The dial indicates the changing positions of the players on the court and works as a great visual aid for substitutions and positioning. Also includes a dry erase marker. For teaching offensive and defensive positioning we highly recommend using the Tandem Sport Spot Target Training Kit for colorful visual aids. This is a useful coaching tool to train new volleyball players where they need to initially position themselves. 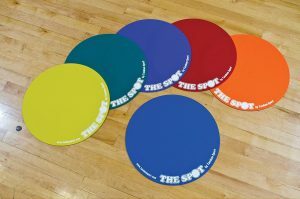 Place the non-slip mats on the ground to designate and remind players where they should be standing. These mats have a diameter of 17 inches and are 2 mm thick. Just don’t try using these outside when its windy! The Tandem Sport Finger Supports helps provide lightweight support for your fingers and are made from elastic. They come in a set of 10 and have a slim profile for smaller hands and fingers and will most likely only fit female hands. Males have complained of these cutting off circulation. 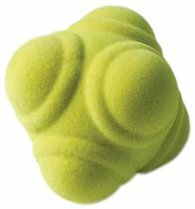 The Tandem Reaction Ball is a six-sided rubber bouncy ball that moves unpredictably to help improve reaction time, hand-eye coordination and agility. Bounces easily off solid, hard surfaces and walls and is a useful training tool for any sport. Can be used by yourself or in team practices. 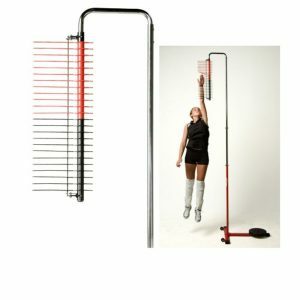 While this isn’t necessarily a specific training or practice tool, the Tandem Sport Vertical Challenger Jump Tester will tell you exactly how high you can jump and is a great tool for measuring progress. 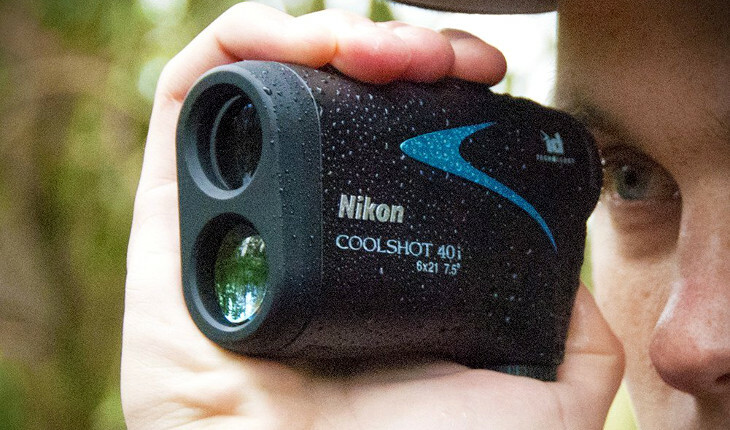 It measures a vertical height between 4 and 12 feet with movable arms at 1″ intervals. The heavy duty base has easy glide casters for stability and portability and it also comes with a reset pole to align the arms after each jump height test. Good for coaches who want to track the progress of their players. 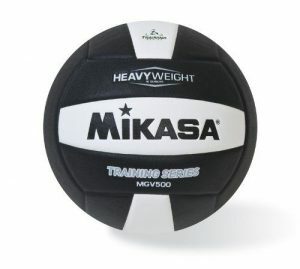 One of the best training volleyballs is the Mikasa MGV500 Heavy Weight Volleyball. It weighs in at a heavy 16 oz and has a nice composite cover and soft feel. 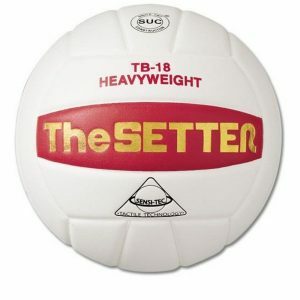 This is a setters training ball that can help both novice and advanced players strengthen their hands, wrists and fingers and improve ball control. A regulation volleyball weighs 10 oz, so this ball is noticeably heavier which helps to learn proper setting techniques. Mikasa, as usual, is a great brand and has made an excellent setter’s training volleyball here. This is an amazing spike training device. The Tandem Sport Spike Challenger holds a pre-positioned ball in place to create a perfect ‘set’ each time. Players can focus on footwork, form and arm motion without having to think about timing. This is ideal for practicing repetitive drills to focus on improving spiking. The pole height is adjustable for hitters of different sizes and skill levels through a ball and cord system. 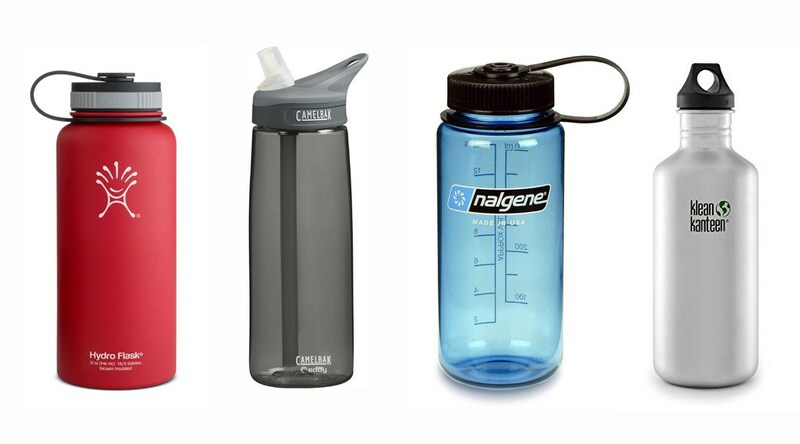 The bottom includes a weight for stability with two wheels for easier portability and placement. 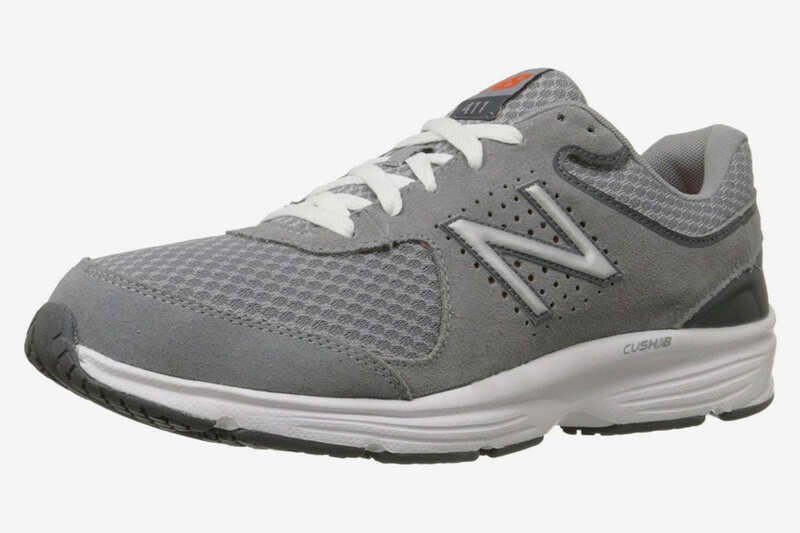 An inexpensive and simpler alternative is this Spike Trainer. 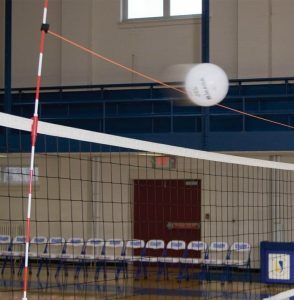 It is essentially a steel extension pole with a contoured PVC pipe and foam covering to hold a volleyball in place. Works great for practicing sets to improve hitting and timing and is easier for practices with players of different heights since you can hold the height to wherever you want it. The Tandem Sport Net Extender Volleyball Training Tool is much cheaper compared to the other blocking tools but is still quite effective. It is made of durable, stretchable elastic that attaches to the net antennae via Velcro fasteners. This allows a player to practice serving and attacking while trying to avoid hitting the elastic blocker. This elastic can be attached at any height to the antennae for different levels of practice. Just be aware that the elastic is a little heavy and some have reported it sagging and dipping in the middle. Volleyball blocking tools are useful coaching and practice tools in blocking drills. The Tandem Sport Bungee Blocker is constructed of lightweight aluminum with vertical bungee cords to simulate in-game blocks during practice sessions. The coach or another player simply holds it up to block the volleyball so players can work on improving their hitting placement. This works well for both team and individual hitting drills and provides good blocking coverage for recreating game situations. The Tandem Round Blocking Pad Set are exactly like they sound. They include 2 reinforced circular blocking pads with hand straps for easy control. This allows a player to jump up and block larger areas while another person practices hitting. The pad is made of foam with a PVC fabric cover. Dimensions are 11.8″ x 2″. The Tandem Sport Quad Blocker has 4 separate blocking units that clip onto the net for controlled blocks. These are useful for hitting accuracy and placement drills to practice aim. They work as a good blocking coverage tool and are made of durable fiberglass rods with NR foam padding. 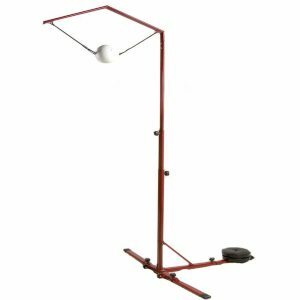 If you want the most complete solution for volleyball target practice, the best training tool is the Bownet Volleyball Practice Station. 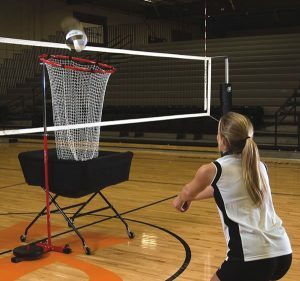 It includes a volleyball barrier net, a sock catching net and a practice court net to simulate game situations and to help players improve their setting and serving techniques. This is a great addition to any volleyball training program. Two people can setup the whole unit within 160 seconds without any tools for hassle free setup. 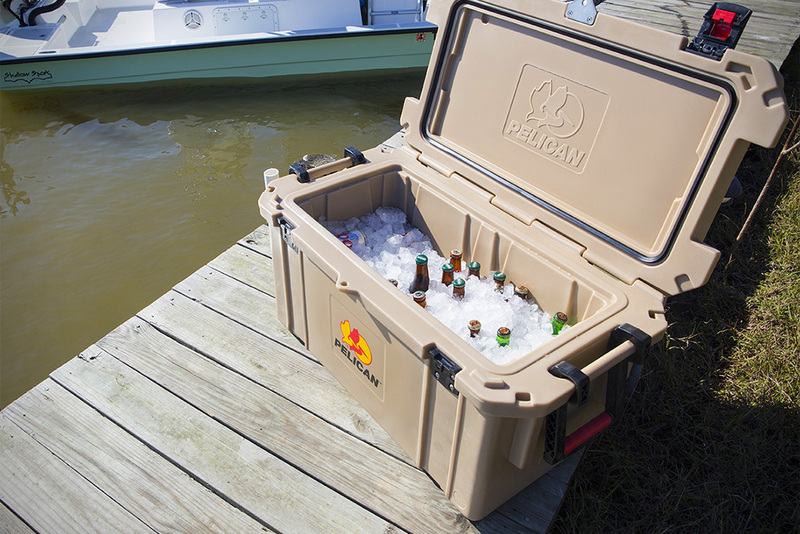 It also comes with a ground frame, BOW-pole and a roller case for easy portability and storage. 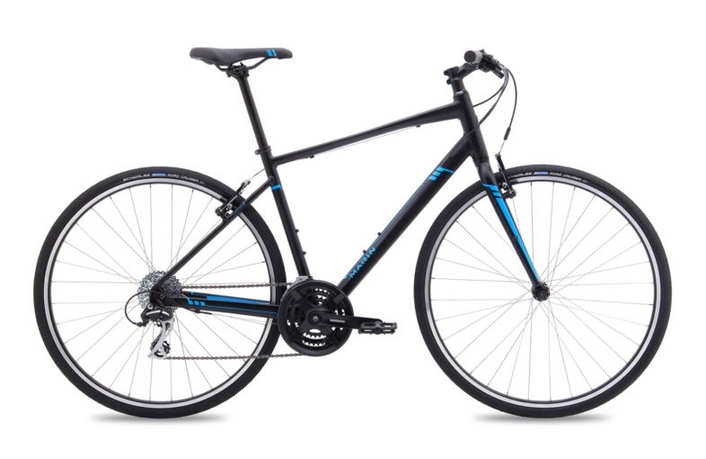 The construction is high quality with a powder coated steel frame and non-marking rubber feet so it won’t damage floors while providing good stability both indoor and outdoors. Bownet also uses their own proprietary Energy Absorption System (E.A.S.) technology to help to diffuse the ball energy throughout the net for better stability and flexibility through repeated impacts. 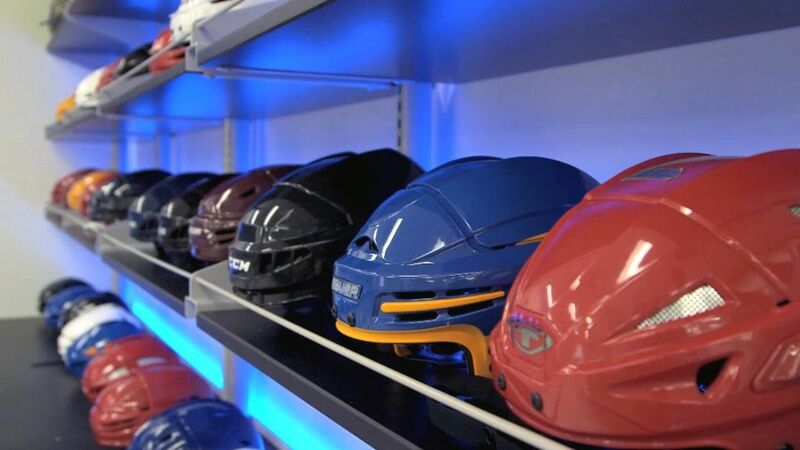 This technology also allows the unit to be more durable and to last longer over time. 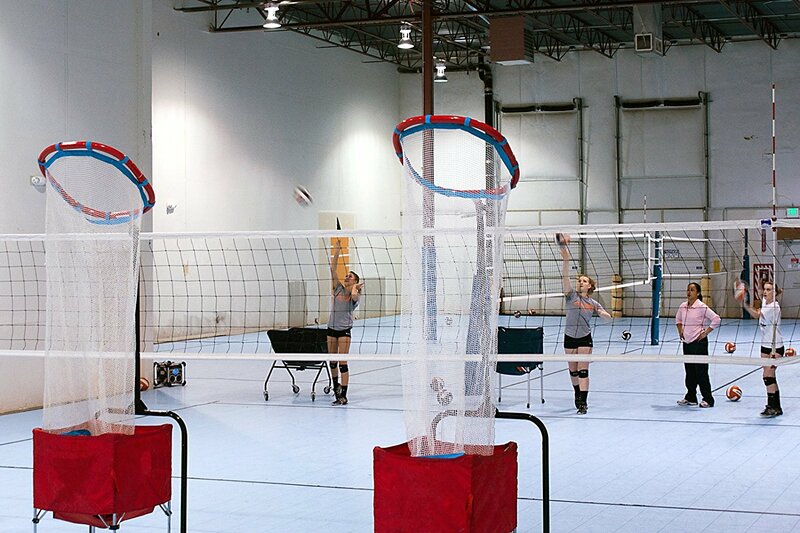 Another great net for volleyball target practice is the Park & Sun Sports: Spectrum Precision Adjustable Target Net. Set them up on the opposite side of the court to practice bumping and spiking into the target hoop. The adjustable target can be angled at 45, 90, 135 and 180 degrees and raised to 76″, 106″, 114″, 122″ and 130″ tall and funnels into a ball cart. For extra durability and stability to withstand powerful spiked volleyballs, the frame is constructed of sturdy welded steel and the net is attached with Velcro straps. It also has front rubber wheels that swivel to quickly move the target into position for practice. 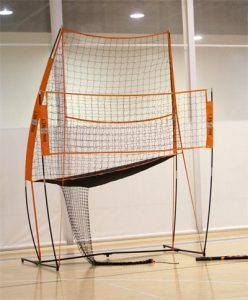 An alternative to the Spectrum Precision Target Net is the Tandem Sport Target Challenger. They are similar in design with an adjustable pole height and angled target ring. However we found the Target Challenger to be less durable compared to the Spectrum Precision Target Net and the net comes off a little too easily during powerful spikes.